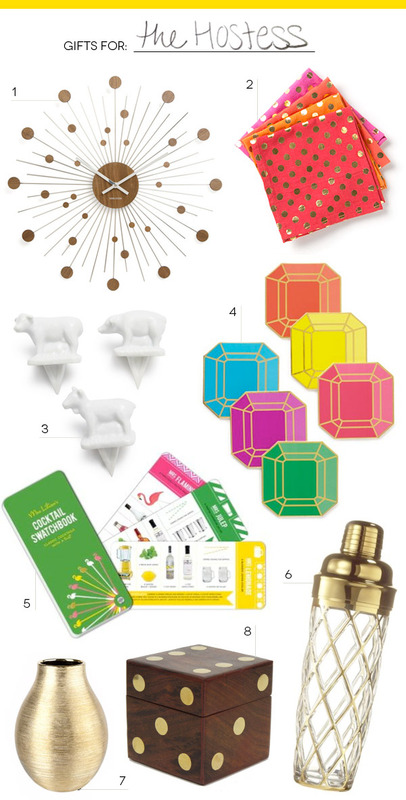 More exciting than the traditional bottle of wine, my final gift guide is full of ideas for the holiday hostess. Whether a gilded martini shaker or jeweled coasters, these gifts are sure to impress! Shop These Items: 1. ModCloth Retro Wall Clock 2. Anthropologie Foiled Dot Napkins 3. Sur La Table Barnyard Cheese Pins 4. Kate Spade Paper Gem Coasters 5. Sur La Table Mrs. Lilien's Cocktail Swatchbook 6. Target Altuzarra Shaker 7. Zara Home Sewall Vase 8. Furbish Wooden Dice.